What kind of world do you want to invest in? New tool analyzing Gates Foundation, Wellcome Trust, ABP, CPPIB & others shows high costs of not divesting from fossil fuels. Global banking firm UBS is currently running an ad campaign that asks: “Do I invest in the world I am in? Or the one I want?” This question has never been more pertinent as we come to grips with the climate reality on the eve of the Paris climate talks. In our market society, investors have immense power to shape norms and political culture on questions of economic importance. To date, the conventional wisdom has been that investing to foster a world that accelerates the shift from old fossil fuel energy to new clean energy is a well intentioned, but bad idea if you care about financial returns. As the fossil fuel divestment movement took flight over the past few years, many of the wise stewards of capital at university endowments and pension funds warned of the financial harm that would result if divestiture was pursued. An article in the Wall Street Journal summed it up with a headline: The feel-good folly of fossil fuel divestment. The argument went that shifting capital out of fossil fuels would constrain the investment universe, in turn leading to reduced returns. It’s now been three years since the fossil fuel divestment movement was launched by 350.org’s Bill McKibben’s article in Rolling Stone Magazine. And the evidence is clear: not divesting has destroyed billions of dollars of investor wealth. 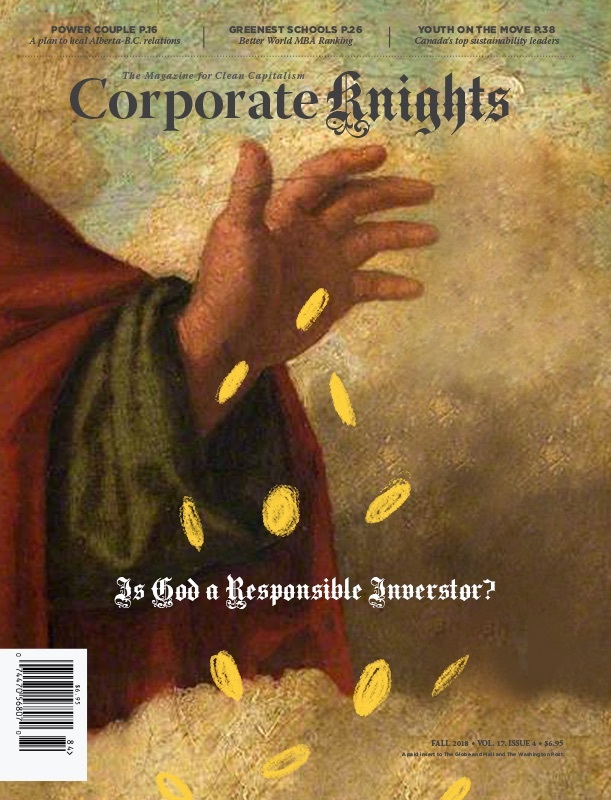 In the analysis Corporate Knights released in November, which examined 14 major funds with a collective $1 trillion in assets, we found that over $22 billion (U.S.) had been sacrificed as a result of not shifting out of fossil fuels into clean energy stocks three years ago. Contrary to the conventional wisdom, divesting from fossil fuels in favour of clean energy has been a huge money-maker. Oil and coal prices may recover somewhat over the next several years, but make no mistake – the global economic shift away from declining fossil fuel industries toward the rising clean energy economy is already under way. Investors who fail to grasp this reality will do significant financial harm to the people who have entrusted them with their savings. Some of the biggest investors are already getting with the program. PFZW, the $183 billion Dutch pension fund, has pledged to halve its carbon footprint by 2020 while increasing its investments in climate solutions fourfold. AXA, the French insurer with $1.6 trillion in assets under management, is selling off its stakes in mining companies and electric utilities deriving over 50 per cent of their turnover from coal, while tripling its green investments. Overall, however, investors have been dragging their heels – too reliant on outdated asset allocation models ill-equipped to navigate the future. In order to make a timely transition from the fossil fuel age to the clean energy age, we cannot afford to have such a large portion of the capital markets missing in action. That is why regulators are stepping in. The French government recently amended legislation to require institutional investors to report their carbon footprints as well as how they are contributing to the international goal of limiting climate change. State lawmakers in California have passed a bill banning its largest public pension funds from investing in coal stocks. Recognizing that investors need data to decarbonize their portfolios, the U.K. government has made it compulsory for listed companies to include emissions data in annual reports. The good news is there is finally a place to reinvest. In the public equity space, there are over 1,300 companies with a collective market value of over $2.3 trillion that Bloomberg has identified as earning significant sources of revenue from the new energy economy. That is bigger than the collective $2.2 trillion value of the global coal and oil stocks as tracked in the MSCI index. The story of a fossil fuel sector being overtaken by new energy holds for bonds, private equity and real assets such as real estate. Where would you rather invest: in an old energy economy in decline or in a new energy economy on the rise? Do you want to live in a world that falls into dangerous climate change and economic upheaval, or a safer and more prosperous planet? It’s time for investors to get on with it and for governments to enact measures to ensure the take-up is as broad and swift as possible. In this spirit, in partnership with South Pole Group and 350.org, Corporate Knights has created a new tool to empower citizen investors with the financial facts to make the case for shifting investments out of old fossil fuel companies into new energy companies. The Portfolio Decarbonizer powered by carbon data from South Pole Group shows the financial implications of divesting fossil fuel companies in favour of those that derive at least 20 per cent of their revenues from environmental markets or new energy. To get things rolling, Corporate Knights tracked down the investment holdings of 14 major funds and ran the numbers. The results can be seen in the accompanying table. 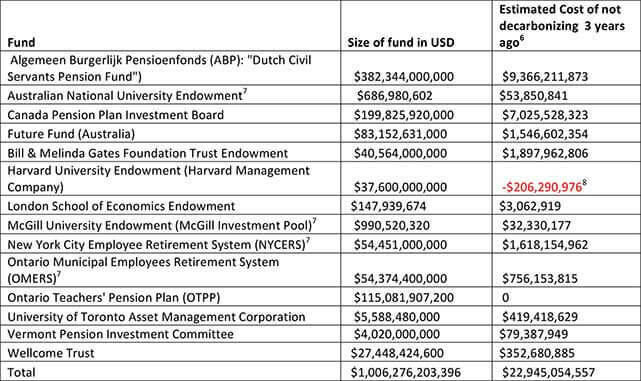 A more comprehensive dataset for these 14 major funds can be found here. Find the portfolio of your college, institution or pension (click here to see how to do this), and run them through the Decarbonizer. Then share the results with us in this form and with the hashtag #decarbonizer so we can share them with all of you and send a clear message about what kind of world we want to invest in. With files from Ahmed Nagi, Jason Visscher and Michael Yow. 6Based on the difference of investing the estimated value of a fund’s public equities holdings (on Sept 30, 2012) in two simulated portfolios (Clean and Uncleaned based on fund’s recently disclosed holdings), rebalanced quarterly over a three year time period to September 30, 2015. The Clean Portfolio excluded the companies with the largest oil and coal reserves as well as coal-fired utilities and re-invested in companies already in the portfolio that earned at least 20 per cent of revenue from new energy or environmental markets. View full methodology here. 7 In the four cases where the fund did not have any companies classified as environmental solution providers, free float market capitalization weighting was used. 8 Money divested from carbon intensive companies was shifted into companies providing environmental solutions already existing in the investor’s portfolio. In Harvard’s case they had just one such company, a sustainable food, feed and fuel ingredients firm called Darling Ingredients, which performed poorly on the stock market over the past three years. Click here to go back to the Decarbonizer landing page.